Since Despicable Me made its debut in 2010, few can avoid seeing the little yellow Minions everywhere they go. With characters like the bitter but lovable evil genius Gru, his funny little ladies Margo, Edith, and Agnes and the sensational Minions, fun is right around the corner. 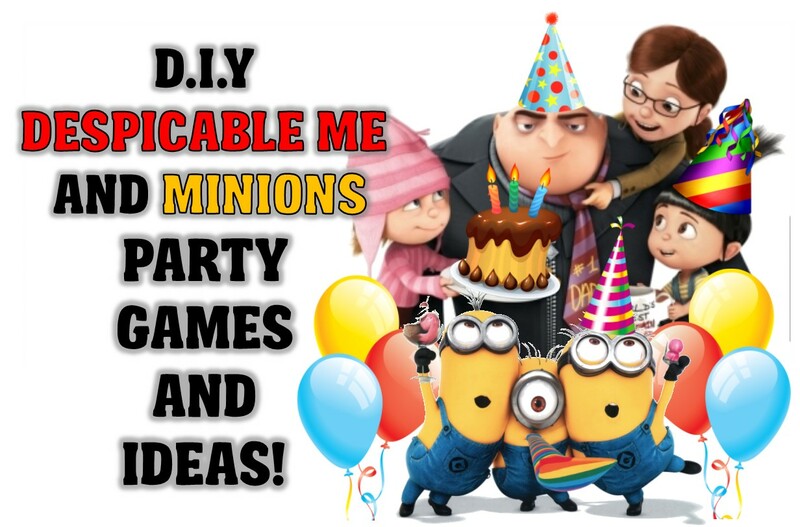 If you have decided to host a Despicable Me party, we are here to help. With Despicable Me invitations, favors, activities, and games all you will need is cake, a place, and guests. So, please feel free to join us on a Minion party adventure and celebrate it, the right way. This is both a great way to start a party or to call one to an end. This relay is all about skill, teamwork, and speed. To prepare, you will need two each of the following: a large pair of overalls (check thrift and second hand stores), a yellow t-shirt, a yellow beanie, and a pair of goggles. Pick a good area for the party goers to race back and forth, at least 15 feet in distance depending on age. On one side of the area you will place a marker (cone, ball, rock. etc.) for the players to run around. Put one of each of the needed items above in a pile on the opposite side of the marker. Have the party group split into two groups. Have each group form a line in front of their pile. When the game begins a player from each team will quickly put on the minion clothes as fast as possible, run around the set marker, back to their team, and then undress so that the next person can take their turn at being a minion. The first team to have every player complete the relay as a minion, wins the game. With a game like this you can play in teams or it can be single players. The idea is to have everyone create their very own evil genius plan. Give each team or player a blank blue print (blue construction paper), a couple of markers, and set a timer for 10 minutes. Each player/team has 10 minutes to create a master plan for how they are going to capture a priceless object and hold it for a ransom of goodies. Based on age, you may need to give suggestions like using the world’s largest lasso, or building a huge magnet, any silly or unrealistic suggestions can unleash a wonderful outpouring of creative thought. Once the 10 minute limit is up you or a judge will decide which plan was the most promising in nature. You can also give each person or team a prize/ransom (this is a great opportunity to use goody bags). Team work is something that children can sometimes struggle with. With that in mind, we have a game that will help to build an environment for them to work together yet still be competitive….as minions of course. You will need a few things for this game. First, you will need a yellow bandana. Second, you are going to need a broom handle (you can use a dollar tree broom just make sure it has the plastic loop at the top). Lastly you will need strips of purple cloth, about 1 ft. long by 2 inches wide. You will need enough for 2 per player. Begin by unscrewing the broom from the handle and loosely tying the bandana to the loop at the top of the broom handle. Now place the handle into the ground outside, preferably in the center of a large area. Select three children to be the good minions who will guard their flag. The remaining children will be the bad minions. They are to receive 2 purple strips and place one on each side of their waistbands, leaving about 10 inches hanging over. The mission for the bad minions is to capture the flag of the good minions and take over the world. But the good minions aren’t giving up without a fight. While the bad minions are trying to capture the flag, the good minions are trying to protect it and remove the purple strips from the bad minions. If a bad minion loses both of his strips he becomes a good minion and guards the flag. The first minion to capture the flag rules the world!! How fluffy can you make it! For this game you will need two over-sized white t-shirts, two pink party hats, and a load of balloons. Divide children into two teams ( you can have more teams but you will need an additional shirt and party hat for each additional team. One person from each team is chosen to be The Fluffy. The put on the t-shirt and the unicorn horn (party hat) and stand in the center of their team. On the start of go the teams attempt to stuff as many balloons into the t-shirt as they can, making The Fluffy as fluffy as possible. At the end of two minutes call time and team members must step back from The Fluffy. The Fluffy that is stuffed with the most balloons wins! You can play the multiple times letting different people be The Fluffy - the kids LOVE IT! All you will need for this fun little twist on a classic game are willing participants, a picture of Gru’s face, a paper plate, glue, scissors, hole-puncher, and yarn. Begin by punching two holes in the paper plate, one on each side. Run a string through each side and tie off at the plate. These will be used to tie around the child’s head. Glue the picture of Gru on the front of the plate. Take a volunteer for the position of Gru and have them place the mask around their head. The remaining children will sit in a circle on the floor. Gru will then circle the group saying Duck, Duck, Duck….- and then say "Gru!!!" to the person they choose. The person that is tagged must get up and tag Gru before he makes it around the circle and sits back in their spot. If they make it, the other child becomes Gru and the game continues. If Gru is caught, he must try again. This game is fun and can be played over and over. This is a great outside summer activity. It’s also great exercise and a way to use all those nerf guns you have lying around. Give each child a nerf gun (now known as a Freeze Ray) and separate them into 2 teams. Then have them spread out in a field. When the game begins they will run and start to shoot at each other. When a person is hit by the "freeze ray" will have to do just that, freeze. They cannot move until a teammate unleashes them by tapping their shoulder. The team with players left at the end, wins. This game combines bowling and fruit, what a great combo. First you will need a bunch of bananas, yellow plastic cups, and a black marker. Flip 10 cups over, open side down, and use the marker to draw minion glasses on each cup. You can also print minion features on sticker paper to place on the cups if you like. Place four open side down, side by side. Then stack 3 on top to create a pyramid effect, then two more, then one. Place one banana on the top cup. The mission is to knock over the banana while trying to knock over the fewest cups you can in the process. The person to successfully knock off the banana with the fewest cup casualties, wins the rest of the bananas, a minions favorites snack!! This game is extremely simple and puts a twist on a classic favorite. All you will need is to print out a large image of a minion without goggles, also print a picture of the goggles by themselves (one for each child participating), double sided tape, and a blindfold. Start by hanging the image of the minion on the wall/tree, designate an area that is at least four feet from the poster, as the starting line. Before the game begins you will have the player put on a blindfold and stand facing the poster. When the game begins the player will have to pin their goggles on the minion. The person to get the closest to pinning the goggles on the correct spot of the minion, wins.